With the Towers piercing the dawning sky and the wild Patagonian winds swirling around, there’s no better place to be curled up in Torres del Paine than at EcoCamp. Recently we had the pleasure of staying at this incredible property in an equally incredible part of the world. Having read countless reviews online it was hard to imagine anywhere could live up to such exceptionally high expectations. Sitting atop a plateau, not too far from the start of the infamous W-Trek, guests to EcoCamp Patagonia find themselves in prime position to see the comings and goings of the park. By staying in the park, you’ll be treated to the very best of nature without giving up any of your home comforts. Not only was EcoCamp Patagonia the first fully sustainable accommodation provider south of the Amazon but they were also the first geodesic property in the world. Leading the way in luxury and customer experience, they’ve also managed to prioritise environmentally friendly practises, something that is clear throughout the glampsite. Though EcoCamp is the proud owner of countless awards (National Geographic Best Outfitter, TripAdvisor Greenleaders Platinum Level, Chile’s Most Sustainable Tourism Company and many more), as guests visiting the site, it’s clear that their sustainable practises extend far beyond awards and paperwork. Composting toilets are used throughout the camp (to the untrained eye, they look and operate just like a normal toilet), lush-smelling biodegradable shower products are provided, reusable water bottles are available on-loan to avoid the use of single-use ones and energy efficient wood-burning fireplaces are used to warm up the domes. The camp itself is powered by solar, wind and micro-hydro turbines whilst propaine gas is used to warm water for guests and though there’s no shortage of power, all guests are encouraged to minimise their impact on the local environment. Each evening, guests come together in the community dome where a cocktail and delicious antipasto platters are served up as the following days’ activities are introduced. In our excitement, we’d already planned out the activities we wanted to do during our stay (as a part of the ‘Patagonia Wildlife Tour‘) but plenty of information is given to help those who are unsure make an informed decision. Generally, there are three options offered up – two that are considered challenging (they are after all based in a mountainous national park famous for its extreme hiking) and one that’s relatively low-key (great for the day after that big trek). Alternatively, EcoCampers are able to relax in their domes, enjoying the scenery around the campsite (and that heavenly bed) but with the national park calling out, the temptation to get amongst the activities, for us, was too great to ignore. Keen to rest our tired bodies after completing most of the W-Trek, we enthusiastically signed up for the Grey Glacier navigation. On a clear day, this includes a boat trip right up to the glacier but unfortunately, with typically Patagonian weather, our navigation wasn’t able to go ahead. Instead, we stopped at a number of viewpoints on our way to the glacial lake and keenly spotted icebergs as they inched closer to land. It was the perfect way to spend the day before taking on the mammoth trek that brought us to Torres del Paine in the first place. The highlight of our visit to Patagonia, day two saw us take on the challenge of the towers – the jewel in Torres del Paine’s crown. It was difficult. It was amazing. It was an absolute once-in-a-lifetime experience and definitely one for your adventure bucket-list. To learn more about our experience, be sure to read our review of the hike to the Base of the Towers. Once your activities are done, there’s plenty of space to unwind with your new-found friends (there’s nothing like undertaking a challenging hike to bring a group together!) in the community domes and in the peak season, yoga is even offered to help relax tired muscles and rejuvenate the soul. There are plenty of times we’ve travelled in the past when we’ve come back more tired than we started. EcoCamp provides the perfect balance of adventure and relaxation though, ensuring that all guests come away fulfilled and recharged – if only we could be as dedicated to looking after ourselves in our everyday lives! With a range of accommodation options, glamping here manages to be absolute bucket-list material whilst still being within reach for your average traveller. From the attainable standard domes (where shared board is available for singles) to the luxurious suite domes, all guests get to enjoy the camp’s incredible hospitality, food and activities, at a price point to suit. During our stay, we had the pleasure of staying in one of EcoCamp’s premium suite domes. I’ll never forget walking in the door and seeing our new little home-away-from-home for the first time; with geodesic patterns lining the ceiling, an expansive (and incredibly comfortable) bed taking pride of place in the room and the fireplace roaring away in anticipation of the chilly night to come, it was incredibly clear that we were in for a treat. Our dome was equipped with a fully functioning bathroom – complete with the most glorious, piping hot, rain shower – exactly the ticket after a long day out on the trails. The staff at EcoCamp are the best of the best. 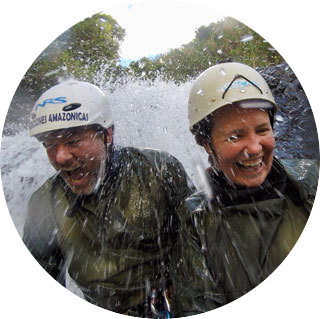 From the guides that personally learn each of your names to the waitresses that enthusiastically exchange travel stories over dinner, the team in Torres del Paine instantly make their guests feel at home, as if part of one big, happy extended family. Nothing was ever a problem and even in the depths of the national park, we experienced service on-par with (if not surpassing) all of the five-star properties we’ve stayed at in the past. It’s funny as when we checked in, we were told that EcoCamp was almost an ‘anti-hotel’ but with care and attention like we were all shown, they’re certainly holding their own against the big boys of the industry. The food on offer at EcoCamp is top notch – there’s no other way to put it. With fully trained chefs personalising menus and a creative barman knocking up delicious concoctions, there was never a shortage of incredible treats to enjoy. Each morning, as guests munch on a fabulous breakfast spread, they decide upon their evening menu. With options like the following, making a decision is easier said than done! It’s hard to believe meals like these are available in the depths of a national park! Lunches are just as gourmet with a selection of breads, meats, cheeses and salads on offer, ensuring that guests are well fueled throughout a busy day of activities. From quinoa salad filled with roasted vegetables and fresh chicken breast to mozzarella, ham and smashed avocado rolls, everyone is free to make exactly what they want, and trust me, you’ll want to make it all. Throw in a brownie, muffin, dried and fresh fruit and a selection of nuts and you’ll start thinking that lunch might just be the highlight of your day out! As delicious as EcoCamp’s food is though, you’d be wrong – nothing beats a day out in the national park. There are some experiences that stay with you long after you leave and, for us, both our hike to the Base of the Towers and our stay at EcoCamp, fit squarely into this category. We were amazed by the level of care and detail that both the staff and facilities offered and genuinely couldn’t fault a thing. Get your pen out team – without a doubt, it’s time to update your travel wish-list! Thank you to the team at EcoCamp for so kindly hosting us. We had the most incredible time but as always, all thoughts are our own. This entry was posted in Accommodation, Chile, Luxury, Patagonia, Reviews, South America. Bookmark the permalink.